Is the sink Duravit Vero or Lacava? Size? Hi! Could you possible tell me what the floor tile brand and size used was? Thank you! Backsplash tile? - What tile is used for the backsplash? Love it! Thanks. It looks great! Yes, that is our Triangle tile from our Dimensional line: http://www.heathceramics.com/home/pages/tile-build/collections-brands/dimensional-2. Please contact us directly for more information, or for a specific quote, we'll be happy to help. Heath Ceramics, can you please give me a call on this particular tile, need info on pricing, etc for interested client. Rebecca 206-388-1038. Thank you. Need help for bathroom remodel - Where did to purchase the sink? Are the tiles used in the shower surround and floor both from Heath? Thanks! Wood Stain - I like this stain, can you share any details about the color? Trough sink - I love the cabinet and trough sink, great job! I would like to know the dimensions of the sink and who makes it please. correction: Lacava 'Luce' 5104 48" x 15" x 6"
floor tile - What is name of the floor tile manufacturer and color? and grout color? this is from Heath Ceramics, it was an overstock tile that I do not know the color name of. they have great stuff - check them out ! Bathroom remodeling - What's the brand/model of the cabinet door handles? the door handles came from Ikea. Minimalist. Sometimes an accent is all you need. 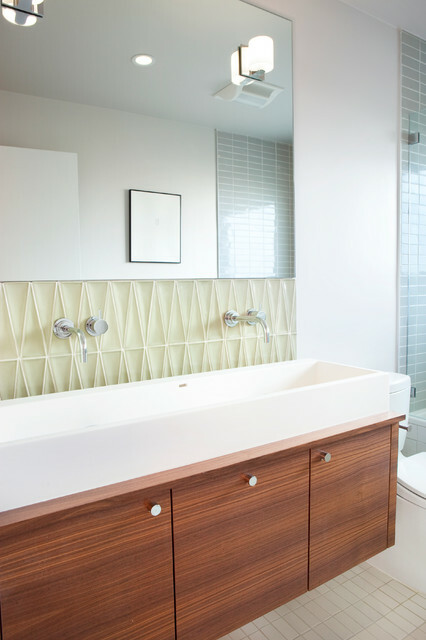 Here, the tile is used as a backsplash to add texture and depth to an otherwise minimalist bathroom. Note that when selecting three-dimensional tile to be used with wall faucets, the trim of the faucet may not lay fully flat, due to the peaks and valleys of the tile. As a result, a slight gap might be visible.